A technical sock, individually fitted for each foot that incorporates extra padding and refinements to the design compared to normal socks. The Source Military Sock has been graciously supplied by Crossfire Australia. Please let the suppliers of Packs and Beyond know how much you appreciate the support they provide, and if this review has influenced your purchasing processes. The material is a mixture of merino wool, and cupron technology. Old issued ADF sock on the left, Source Military Sock on right. Merino wool is an essential material for socks, since it provides a dry, comfortable feeling for the foot, and also wicks moisture away, thereby reducing the likelihood of blisters. Cupron technology is recycled copper that provides an anti-microbial and anti-fungal to prevent odour. Copper is a great deal more environmentally friendly than other anti-microbial materials available. 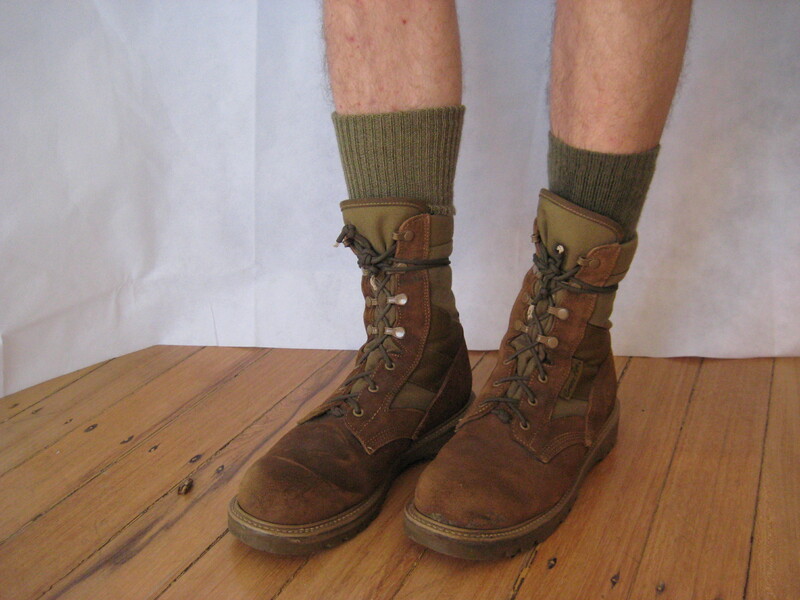 Uniquely, the Cupron Military Socks come fitted for each foot. This means each foot has specific cushioning and elastic reinforcement. Helpfully, they are marked with L & R for the respective feet. Starting at the toes, the seam is very flat compared to other socks I’ve experienced. This has some real benefit for reduction of rubbing points and thereby helping to avoid blisters. High abrasion areas that are susceptible to blisters have been reinforced. There are elastic arch braces, and a criss-cross of elastic around the ankle to brace the sock against the foot to prevent excessive abrasion against the foot when walking and running. Running up the ankle parallel with the shin is a ventilation panel. Whilst I am not sure about the efficacy of this ventilation panel, it least provides a crush point as the boot is tightened up around the ankle, thereby reducing the likelihood of discomfort. Old ADF issued sock on the left, Source Military sock on the right. The Source Military Socks are a little thinner than my usual socks. This led to increased foot movement in my preferred walking boot, resulting in a number of hotspots and blisters. Being worn in boots. Old ADF issued sock on left, Source Military Sock on right. Not a particular fault of the sock, just the interface between my preferred boot and the sock that wasn’t included in the sizing of the boot originally. Despite the initial hiccough with one pair of boots, they have still been really good. I have worn them in several other pairs of footwear, including a pair of safety-toe work boots that are notorious for rapidly wearing holes through socks. I found them to withstand abrasion from those stiff boots very well. I was somewhat concerned about the dedicated right and left fit, since it has been my experience under field or work conditions that when the situation is urgent, you rarely have time (or enough light…) to check the finer points of dressing especially when fatigue levels are such that blue elephants seem to be wandering around the position! Thankfully, these socks still feel very comfortable when worn on the wrong foot. To test this concept, and much to the consternation of my darling wife, I wore a pair of them for seven days straight. This involved some hard physical labouring in summer heat – a guaranteed recipe for microbial growth in footwear for me. I’m pleased to report (although my darling beloved isn’t quite so enamoured) that the Source Cupron material means my socks didn’t smell too bad at the end of this testing period. However, in the interests of accurate reporting, it must be mentioned that my feet smelled as bad as they usually do. Normally under hard work, both feet and sock would smell to high heaven, so this is an interesting result. I’ve been wearing this sock under some long distance walking for work, with over 35 kilometres (approx. 21.7 miles) covered in a single working week. So far, they have performed well. Comfortable, well fitting, and well made sock. The anti-microbial properties of the cupron material provide some useful function in rough field, or busy work environments. The subdued colour is appropriate for field use, unlike a lot of technical socks designed for bushwalking/hiking/tramping usage in the civilian market. This has the added bonus of not attracting too much attention from Morale Vampires when they start their witch-hunts. Such things as footwear and socks are a very subjective thing for individuals, so these may or may not suit your particular tastes. In my favourite pair of walking boots (Crossfire Peacekeepers) the Source military socks don’t seem to be as thick as the socks I originally measured up my feet for in these boots. This means a little bit more movement leading to slightly increased hot spots and sometimes blisters. In every other boot I’ve tried it in (some of my safety-toe work boots are notorious for hot spots and blisters) the Source Military Socks have performed really well. I honestly don’t know what to make of this strange phenomenon. I’m obviously odd…. Not a bad sock, should they fit your feet and footwear system. Posted in Clothing & Footwear, Crossfire, Gear by 22F with 5 comments. I bought a couple of pairs of these socks and found them okay but far too short (they are the correct size). They drop down inside the top of your boots (Danner 8 inch Arcadia’s). They need to be able to reach at least mid calf or higher, they can always be folded down if you don’t like them higher. Because of the mentioned problem I now only wear them with walking shoes when travelling. Dare I say Russel, that I may not have noticed this due to my ankles/legs being very skinny (chook legs as we call them in these parts)? I have to agree though, due to a few reasons, I only wear these socks with certain items of footwear at the moment. Glad they really work for you George!